Can Hamza bin Laden Lead Al-Qaeda? 35 years ago, it was the chance that led Al-Qaeda leader, Osama bin Laden, to marry Khairia Saber, known as “Um Hamza”, who was the therapist of Saad—Osama Bin Laden’s child from his second wife—who suffered from autism. In a conservative community such as the Kingdom of Saudi Arabia, Khairia, as a single woman in her mid-thirties, did not hesitate to accept Osama’s proposal. For many Saudi women at that time, Osama Bin Laden might be an ideal husband. He was extremely wealthy, from a prestigious family, and had a community recognition as a major funder for the Arab Mujahideen in Afghanistan. After the frustration of several miscarriages, Osama and Khairia finally produced a son, Hamza, in 1989. Two years after their marriage, the family moved to Sudan, as Bin Laden was no longer welcome in Saudi Arabia. In Sudan, Khaira captured the heart and mind of her husband, and similarly gained the respect of his family and the wives of Al-Qaeda’s members. Hamza was 7-years-old when his family had to leave Sudan. Forced out under U.S. pressure, they went to Afghanistan, where the Taliban movement had come to power and offered Al-Qaeda safe haven. Just as Khairia succeeded in becoming the closest of Osama’s wives, so her son, Hamza, became Osama’s favorite child. This was noticeable even in the 1990s in such things as his appearance standing beside his father at one of the training camps in Afghanistan. Despite that emotional closeness, the geographic proximity between father and did not last long. After the 9/11 attacks, as Al-Qaeda prepared for the U.S.’s response, Osama ordered his family to take shelter in Kandahar until they could be transferred to a more permanent safe environment. Initially, the Bin Laden caravan, including Hamza and his mother, were intended to be sent to Pakistan. But the decisive U.S. pressure on Islamabad at that moment to join the war against terrorism or face penalties required Al-Qaeda’s leader to change his plan. For many, it is inconceivable that a radical Sunni group could find refuge in Iran, the stronghold of Shi’ism. However, Bin Laden was pragmatic on this issue. Iran shares a geographical border with Afghanistan, and, unlike some other countries surrounding Afghanistan, is inaccessible for U.S. troops. On the other side of the equation, the Iranian regime did not object to the presence of Bin Laden’s family on its territory. On the contrary, Iran could exploit Al-Qaeda to pressure the U.S. as needed and by holding Al-Qaeda’s leadership the Iranians also had an insurance policy against the terrorists themselves. Al-Qaeda and Iran, therefore, both met their needs by having the Bin Laden family in the country. In Iran, Saif al-Adl, one of the closest confidants of Al-Qaeda’s leader, had gone ahead and was waiting for the family’s arrival. He was not the only one. Iranian intelligence was ready for the newcomers, having established relations with al-Adl, and kept all of the Al-Qaeda refugees under a close surveillance. After 2003, to tighten control over the family, 14-year-old Hamza and his mother were kept by the Iranian regime in various military facilities, all of which were fortified and monitored 24 hours-per-day. Despite these circumstances, neither Khairia nor Osama gave up their ambitions for their son. Khairia took responsibility for educating Hamza, delegating Saif al-Adl to lead the teaching of the Qur’an, Fiqh, Hadith, and the Sunnah. Abu Mohammed al-Masri would bless Hamza’s marriage to his daughter, Maryam, when Hamza became 17-years-old. By integrating Hamza, physically and intellectually, among Al-Qaeda’s senior leaders and founders, it provided him with practical training in jihadism he could acquire no other way, and for the leaders they were effectively investing shares in a young man who might one day lead their organization. Having so many of Al-Qaeda’s senior leadership in its custody meant Iran could exert heavy influence over the group by the late 2000s. This was somewhat altered in 2010, after Al-Qaeda kidnapped the Iranian diplomat, Hashmatullah Atharzadeh. In a prisoner exchange, facilitated by the Haqqani Network, Zadeh was released by Al-Qaeda and Iran released a number of Al-Qaeda members, including Hamza and his mother. The Bin Laden family dispersed to a number of locations after leaving Iran. Hamza had at one point been destined for Qatar. In Doha, Osama believed, Hamza could enjoy the freedom to advocate for Al-Qaeda on Al-Jazeera’s television channel, among other things. But the advice of Attiyah Abdul Rahman, a trusted Al-Qaeda operative close to Osama, convinced the leader to change his decision, since Qatar—a U.S. ally and host to an enormous U.S. military base—might hand over Hamza. A number of family members converged on Abbottabad, 100 miles from Waziristan, where Osama had been hiding since around 2006. Osama’s 23-year-old son, Khalid bin Laden, had remained by his father’s side for many years and was fully prepared to defend his father with his own life, but was not judged to have the necessary qualifications for leadership. Hamza, a year younger than Khalid, was thought by Osama to have such qualities and in late 2010 Al-Qaeda’s leader set about bringing Hamza to join him in Abbottabad. Osama clearly did not view Hamza as completely ready at this time to take on a greater role in Al-Qaeda. Among other things, Osama instructed Hamza to undergo combat training until he could be brought to Abbottabad. But there were more immediate tasks that Osama clearly believed Hamza could assist with. Saad had been killed in a U.S. drone strike in 2009, and the security situation at the Abbottabad compound itself had become shaky. Osama’s personal guards were physically and psychologically exhausted and had asked that Osama begin the process of leaving. In February 2011, the plan to bring Hamza to Abbottabad was in place. Hamza would travel through Baluchistan on a circuitous route to his father’s abode. In Baluchistan, Hamza was to meet Omar Siddiqui Azmari, a trusted Al-Qaeda agent, who would lead Hamza to Peshawar, where Hamza would meet another man, who would take him to Abbottabad. By the end of April 2011, Hamza had nearly completed his trip, awaiting only for a cloudy sky to begin the final leg of his journey. In the event, the cloud cover came too late. In the early hours of May 2, 2011, Osama, Khalid, and three others were killed at their compound in Pakistan in an operation by the U.S. Navy SEALs. Hamza would remain silent until 2015. In the intervening four years, many of the Arab uprising that were beginning as Osama was killed were disappointed. Al-Qaeda’s former Iraqi affiliate took advantage of the chaos in Syria to rebrand itself the Islamic State (ISIS) and challenge Al-Qaeda for the leadership of the jihadi world. As ISIS captured global attention, some of Al-Qaeda’s affiliates defected and thousands of foreign recruits joined their “caliphate” project. Osama’s successor, Ayman al-Zawahiri, an uncharismatic figure, seemed unable to rally his men and stop the slide. Perhaps Hamza could. In his August 2015 audio message, Hamza was introduced by al-Zawahiri. 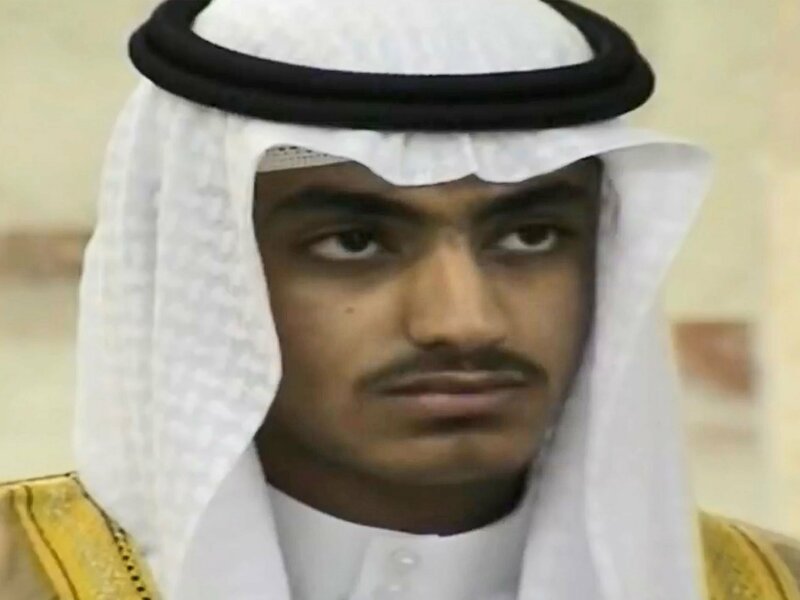 In the recording, Hamza praised the martyrdom of his father and brother Khalid. He praised the Al-Qaeda’s leaders in Syria, Yemen, and North Africa, and celebrated the Fort Hood massacre and the Boston marathon attacks. Hamza concluded by calling on Al-Qaeda’s supporters in Kabul, Baghdad and Gaza to wage jihad against Washington, London, Paris, And Tel Aviv. Further audio messages from Hamza were released in August 2016 and May 2017, calling for attacks on Jewish and Western interests. It is worth noting that Hamza was seeking to create a distinction from ISIS, which was waging a brutal war in the Muslim world itself. Hamza was arguing against this internecine course, saying the jihadists should give priority to targets in the West and Russia. Al-Zawahiri was in a difficult predicament when Hamza appeared in August 2015. Rather than gaining legitimacy because Osama had designated him successor, al-Zawahiri served as a reminder of how far Al-Qaeda had fallen. Even the group’s communications looked antiquated, and the loss of influence among the youth, who were being offered a more dazzling and technologically sophisticated alternative by ISIS, was keenly felt. The significance of Hamza today is the subject of much debate and many questions. He has his father’s legacy: the name and the narrative of being Osama’s favorite son, trained from early life for a role in jihadism. Alongside this inspirational story, he has the charisma al-Zawahiri lacks. And, despite his inexperience, Hamza has been educated by, and is connected to, Al-Qaeda’s senior leaders and founders. So it raises the question: Can Hamza take advantage of a waning ISIS, and the jihadists disillusioned with the ISIS approach who are looking for a new direction, to make Al-Qaeda once again the leader of global jihad? To read the full Arabic version of the article click here and here. Amr Salah is a columnist, analyst, and researcher. He holds a master’s degree in international relations from the University of Exeter, UK.